At the behest of Jesus, His disciples and followers, about 120 of them, were meeting together and awaiting the promised Holy Spirit. On the Sunday of Pentecost, the Spirit came like a rushing wind with tongues of fire upon them and they began proclaiming the mighty works of God in various languages. The marvel of this was that those living in Jerusalem, as well as festival attendees from countless nations, heard these proclamations in their native dialects. 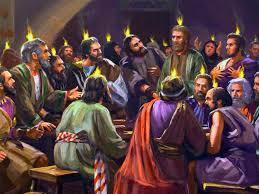 Then Peter stepped forward and proclaimed the Gospel in the power of the Holy Spirit. He preached that they were guilty of crucifying Jesus the Messiah who had died for their sins but God had raised Him from the dead. Those gathered were “cut to the heart” (to the quick!) and they asked Peter what they should do. “And Peter said to them, ‘Repent and be baptized every one of you in the name of Jesus Christ for the forgiveness of your sins, and you will receive the gift of the Holy Spirit. For the promise is for you and for your children and for all who are far off, everyone whom the Lord our God calls to Himself.”” (Acts 2:38-39 ESV) God moved upon these people and He’s been regenerating and transforming lives ever since, even those of us who are “far off.” Is it possible He’s calling you to Himself this very day?